“Sha Na Na started up about the same time in New York. They were on the East Coast and got all the notoriety, but we may have predated them,” original drummer Harold Fielden recalled. Flash Cadillac & the Continental Kids were formed in 1968 at the University of Colorado as a means to pass the time, an oldies rock alternative to the then-popular hippie sound. Mick Manresa eventually signed on as the lead singer. As the original “Flash,” he hid his Asian features behind wraparound shades and slicked-down hair. 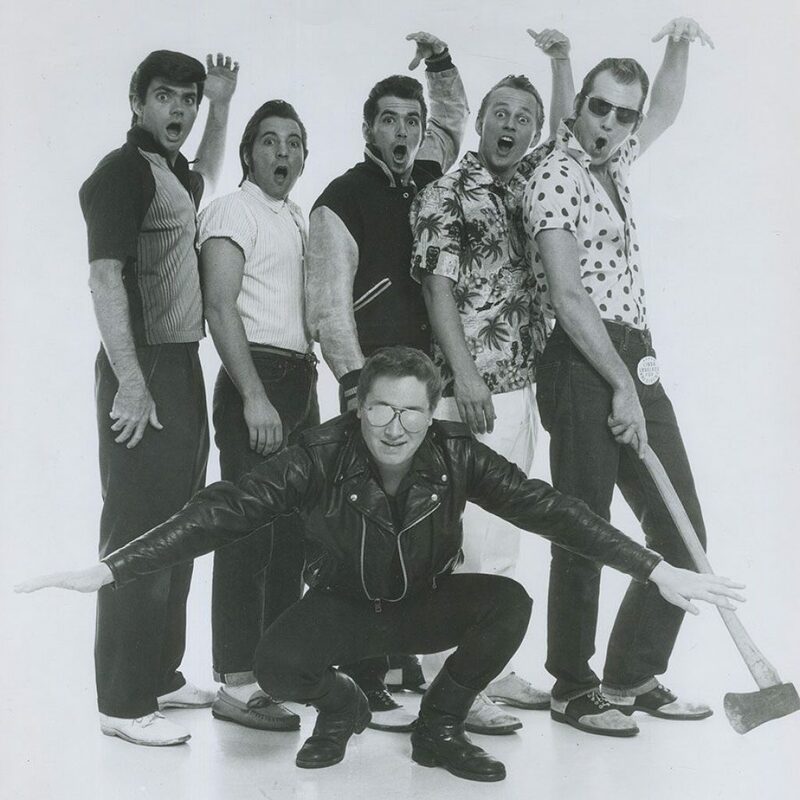 Word quickly spread about the neo-greasers’ rabid live performances. The first paying job came on February 9, 1969, but things got serious quickly. The lewd and rude Flash Cadillac shows at Tulagi became the biggest events in Boulder. The “skin to win” rules for the twist contest, the “wild elephant” for guys (unzipping pants and pulling the front pockets inside-out) and other group participation bits were hatched by Fielden. Exactly one year after their formation, the members of Flash Cadillac drove to L.A. to play a “hoot-night” at the legendary Troubadour. That day they called agents from a pay phone across the street. That night they came on last to a half-empty club and soon had the place packed with patrons dancing on the tables. “It was nice because it proved we weren’t just good in Boulder, we were good anywhere,” Moe said. “All these guys in suits crowded into the dressing room after the show handing us business cards and saying they wanted to sign us. The group quit school and hit the road. Within a year, Fielden and Manresa decided it wasn’t fun anymore and returned to Boulder. Fielden became an attorney in the area, but he and Manresa remained in pursuit of the ultimate gross-out, performing oldies sets with the 4-Nikators and backing up oldies acts like Bo Diddley and the Crystals when they came to town. Having lost their singer and talker, the other members of Flash Cadillac made the big decision to make a go of it as a real working band in 1971. The first step was to find a new Flash. Sam McFadin, a Colorado Springs fan of the band, was the only person considered for the job. Fronted by McFadin, Flash Cadillac gained instant popularity within the music industry. The band became the first act to perform on American Bandstand without having a record. Flash Cadillac earned acclaim in the movies, appearing as the sock-hop band Herby & the Heartbeats playing “At the Hop” in George Lucas’ American Graffiti in 1973, and also a scene with San Francisco rock promoter Bill Graham in Francis Ford Coppola’s 1979 Vietnam epic Apocalypse Now. And Flash Cadillac’s work on television’s Happy Days on March 11, 1975—the episode “Fish and the Fins” was written especially for the band—won the highest weekly rating. Flash Cadillac also began recording albums of oldies and catchy 1950’s-styled pop originals for Epic Records, and the nightmares with record labels began. With the live show, the group never had a problem communicating its patented fraternity-style humor. It was on record that it didn’t come across as well. The band’s second album, There’s No Face Like Chrome, was recorded using three different producers. In 1974, “Youngblood” was the No. 1 song in more than 20 markets, and “Dancin’ (on a Saturday Night)” cracked the Billboard pop singles charts at #93. Flash Cadillac gave the big time one more shot on Private Stock Records, recording minor hits in “Did You Boogie (With Your Baby)” (with spoken interludes by Wolfman Jack) and “Good Times, Rock and Roll.” But a great version of “See My Baby Jive” (a hit for Roy Wood in England) was left hanging in January 1977 when the company’s promotion staff quit over a salary dispute. By that time, Flash Cadillac was looking for land in the Rocky Mountain area. The members—McFadin, Moe, Linn “Spike” Phillips III (guitar), Warren “Butch” Knight (bass), Dwight “Spider” Bement (sax) and the latest in a long line of drummers—purchased a little ranch located near Woodland Park, outside Colorado Springs. All of a sudden, after years on the road, they found they had real lives to lead. Several of them got married, and they began to scale back their careers. The ranch served initially as a rehearsal hall, but after several years the band built up the facility into a 24-track studio. Several businesses were running at once—Flash Cadillac on the road, in the studio and doing commercial work. In the 1980s, the nationally broadcast Super Gold weekly radio program featured Flash Cadillac as the house band. In 1992, the band was reborn performing with symphony orchestras across the country, one of the hottest pops concerts going, and easily the most fun. The symphony musicians got with it, getting old poodle skirts and letter jackets out of mothballs. Flash Cadillac lost cylinders over the years. In March 1993, Phillips, who was known for his crazy on-stage antics, suffered a heart attack backstage after a show and died. He wasn’t replaced in the band, as nobody else could carry McFadin around stage on his shoulders while playing guitar chords. The group’s driving force evaporated when McFadin died of a heart attack in September 2001. Moe, who had retired to the studio due to increasing weakness from ALS (Lou Gehrig’s disease), died after a long struggle with the debilitating muscular disease in July 2005. Knight and Bement continued to lead a rockin’ Flash Cadillac band, with Dave “Thumper” Henry on drums and “new kids” Timothy P. Irvin, Rocky Mitchell and Pete Santilli.